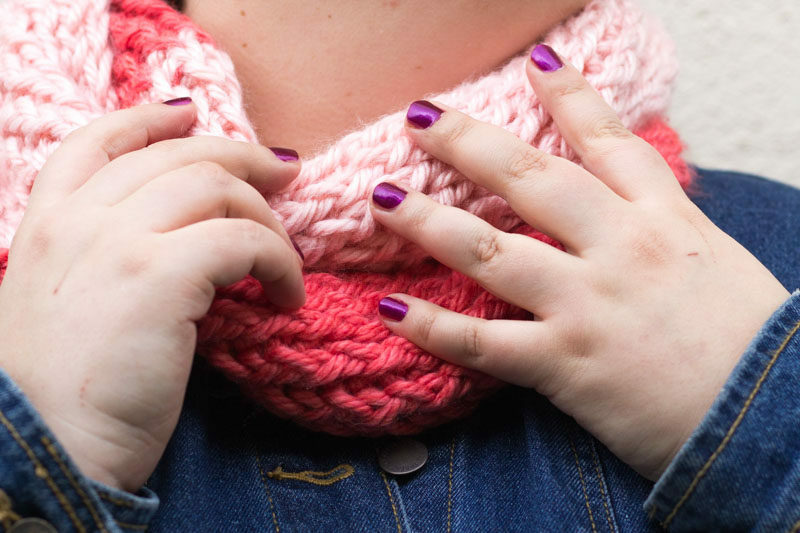 Warm up with a DIY Loom Knit 2 Tone infinity scarf. Super simple and super cozy! 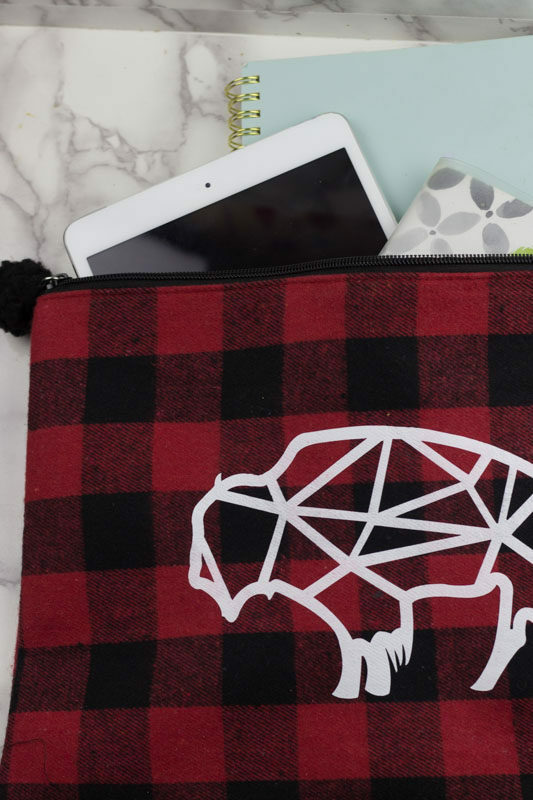 Perfect for the breezy weather and an evening project. So, I came to the realization the other day that my yarn stash is kinda out of control. This scarf has been in the making for a really long time, if only because I bought the yarn a few years ago and couldn’t decide what to do with it. Here’s my yarn shopping process in case you were curious. I head into the craft store to buy very specific yarn for a very specific project. THEN I pass by an endcap with some really pretty new yarn that they’re advertising. If its a color I like, I feel it to see how soft and/or squishy it is. It is not a yarn I need for my project… or need at all. So then, if I’m into it, I tend to grab a skein and wander around the store for approximately 30 minutes, looking at stuff and squishing this yarn to decide if I want it or not. And then I end up buying it 2 out of 3 times. Yep. I’m might have a problem. Last time I tried to Tidy Up, I spent a solid few hours holding yarn close and deciding if it sparked joy. 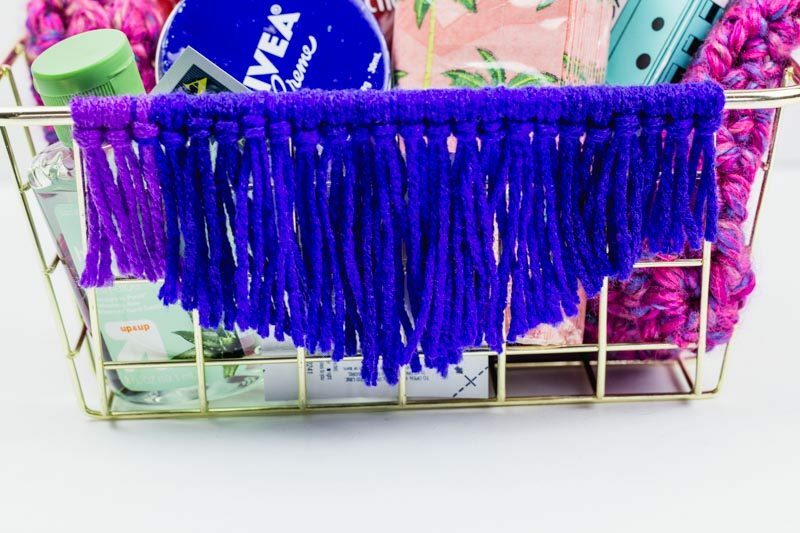 This project uses my favorite chunky yarn – Hometown USA and I saw the two colors side by side and thought… those are just weird enough they might work. So, here we are! Time: An evening or two. I got through this while watching The Mummy 1 and 2. I refuse to acknowledge the 3rd one. 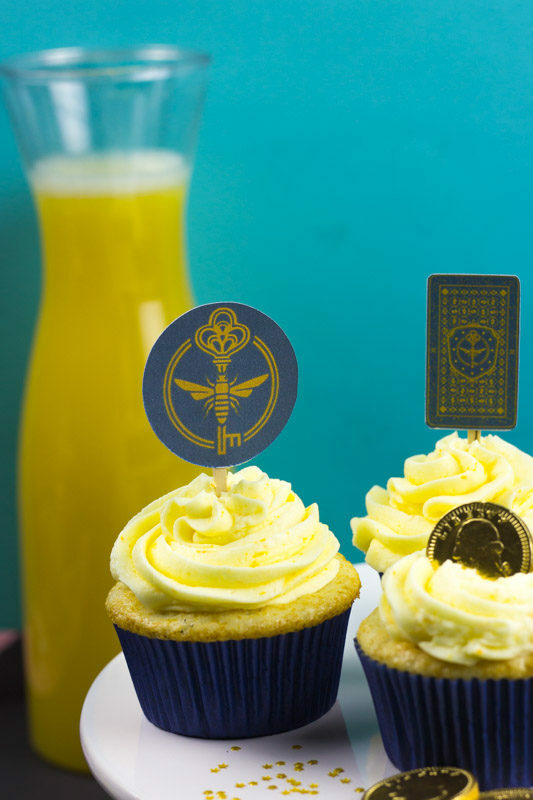 Conjure up some free printable cupcake toppers for the season 4 premiere of Syfy’s The Magicians! And DO SOME G*D DAMN MAGIC! Every year around the holidays, I embark on a Magicians rewatch. Mostly because I can binge the whole series on Netflix and catch up before the new season begins. I’m kinda obsessed at this point. I mean… seriously? 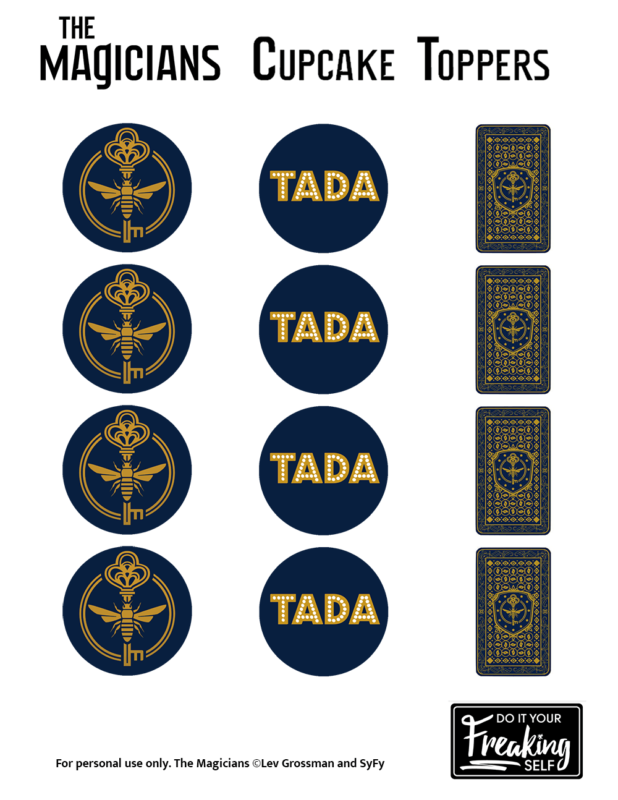 Who doesn’t want to go to Magic Grad School and head off on crazy adventures and quests. I particularly like that we get to see the “science” of spell casting and things within the magic community. There are definitely more other things I like about the show, and if you haven’t watched it yet, I definitely recommend it. Margot and Elliot are goals. 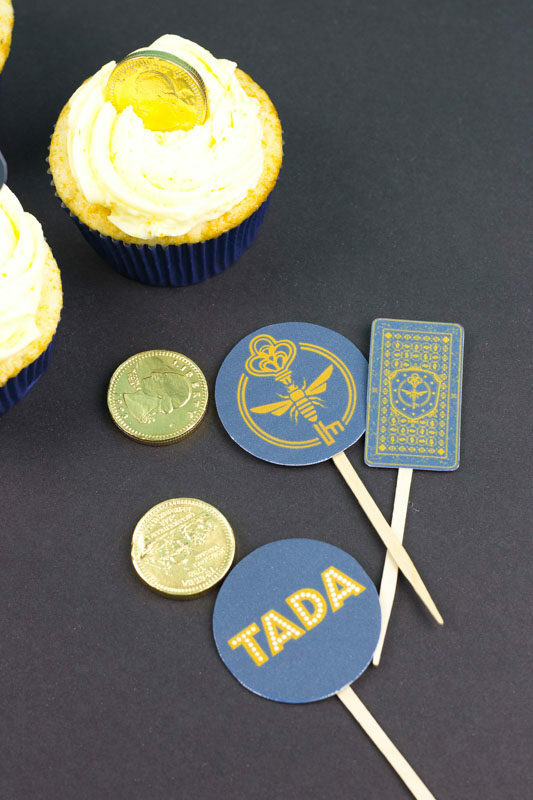 These toppers are a great addition if you, like me, would like to party at the Physical Cottage at one point or another. My discipline is Illusions according to Brakebillsu.com (go take the tests and things!). Without giving away all the secrets, I’m a little in love and you should start watching and then DM me about it so we can geek out over it. Please and thank you. 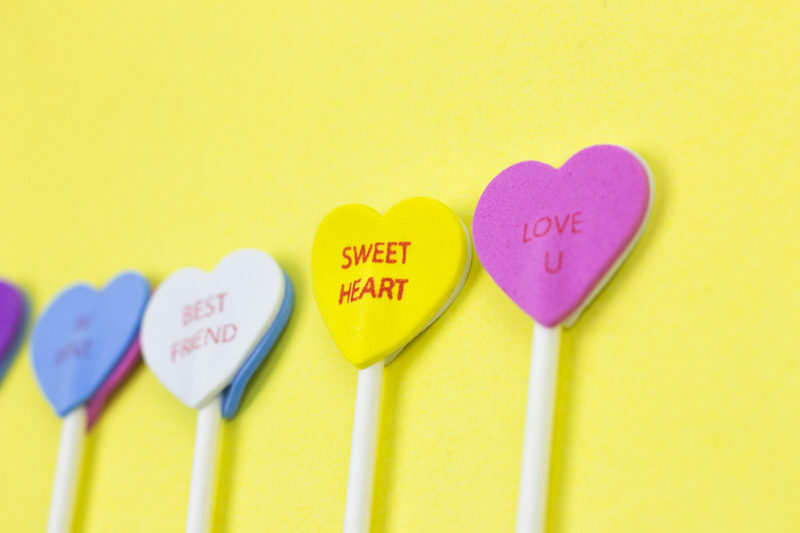 Okay, so these toppers are pretty self explanatory. 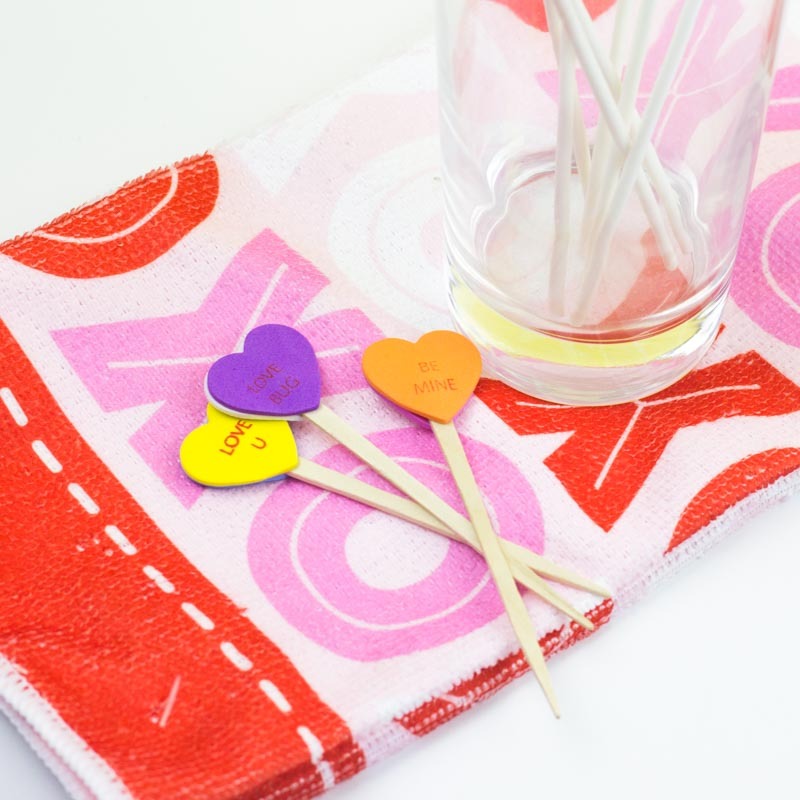 Print them out on some card stock, cut them out and glue or tape them onto some toothpicks. Alternately, you can use the print and cut function on your circuit explore. 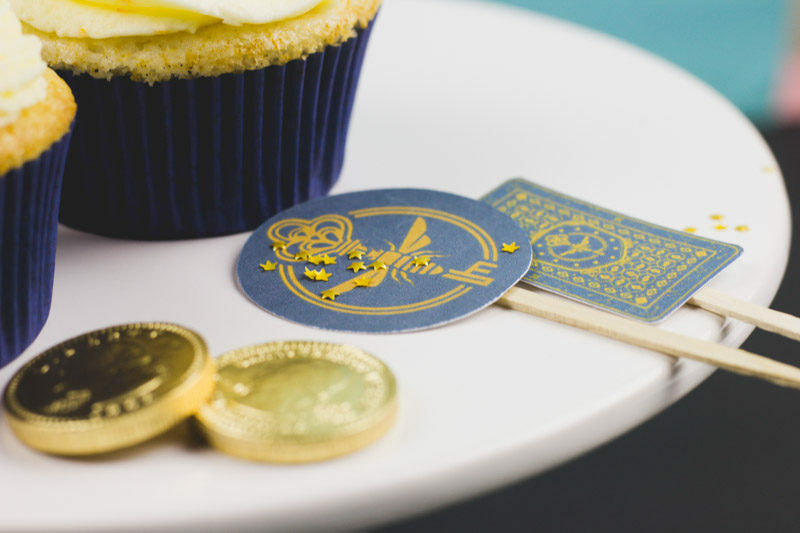 I also added some gold coins as toppers to in a nod to Quentin Coldwater, who can be seen throughout nearly the entire first season with a coin flipping between his fingers. 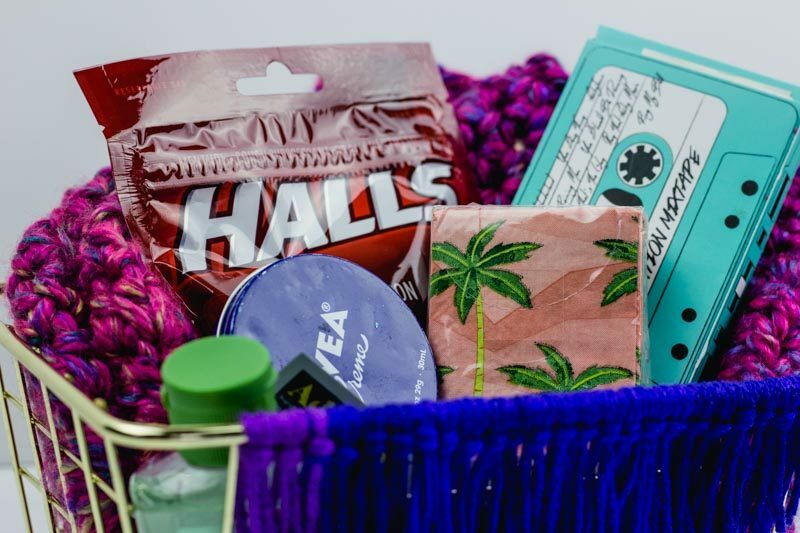 Being sick is a bummer, so help make a friend or loved one’s day with a cute DIY Sick Day Care Package filled with some get well goodies! At 31.5 I still call my mom whenever I get sick. 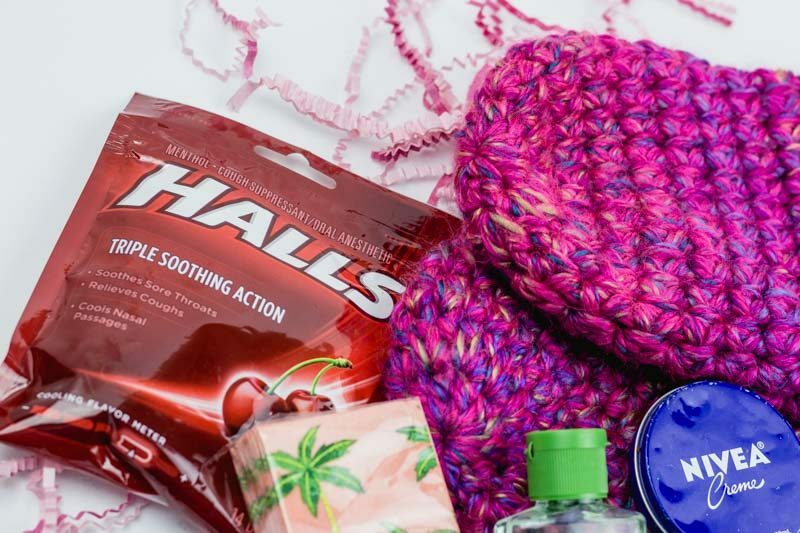 Granted, my mother is a nurse so there is usually reason to, but there is just something about being sick that makes you want your mommy. Unfortunately, I live in LA where my entire friend group is living away pretty far away from family…. so we have to take care of each other. I recently had a dear friend get sick and had to cancel plans. Here’s the thing, I have to schedule nearly my whole life due to work and school and my friends and I are all on different schedules. Between work getting busier and classes starting soon, I’m already scheduling in a mental breakdown for spring break. So, when one of us has to cancel plans because of sickness? Not good. 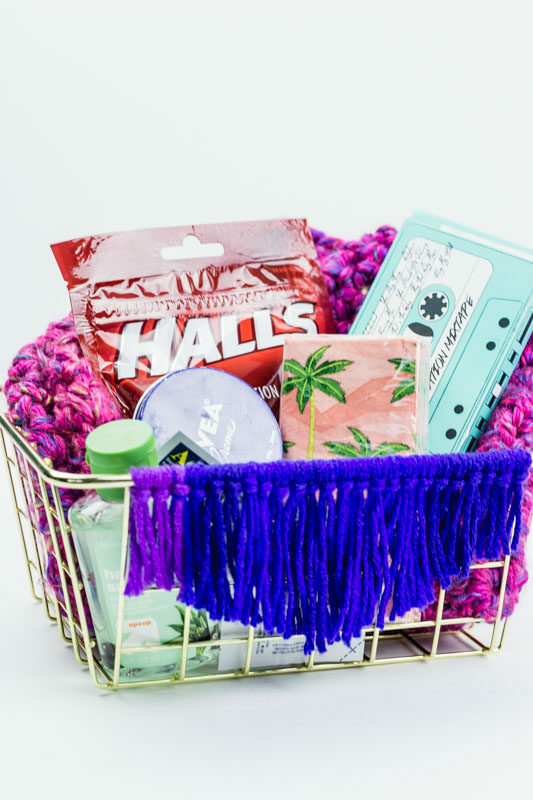 As a result, I filled my time by bringing her a Sick Day basket. I’ve seen a lot of these online where there are crossword puzzles and coloring books, but in the days of Netflix and Chill… I think its safe to say we’re all crashed out on the couch with some orange juice and a cozy blanket waking up in between scenes of Lord of the Rings. 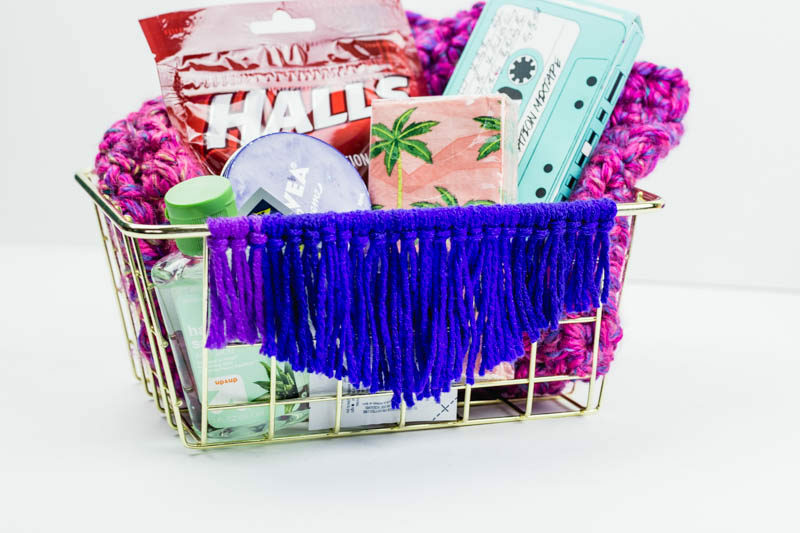 I filled the basket with some essentials that I knew she liked and just dropped it off. Quick note, unless they actually need you to take care of them or want to see you, its probably best to drop it off. 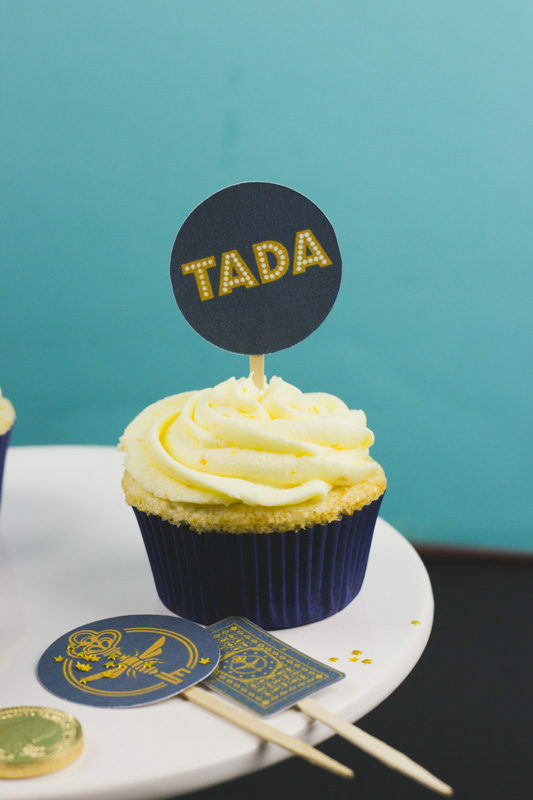 No one wants to deal with guests when they’re doing poorly. 1. 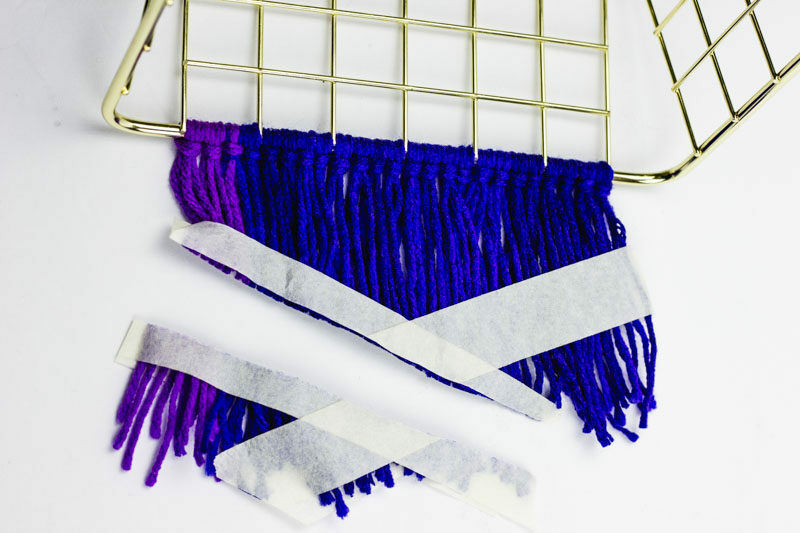 Cut strips of yarn twice the height of your basket. 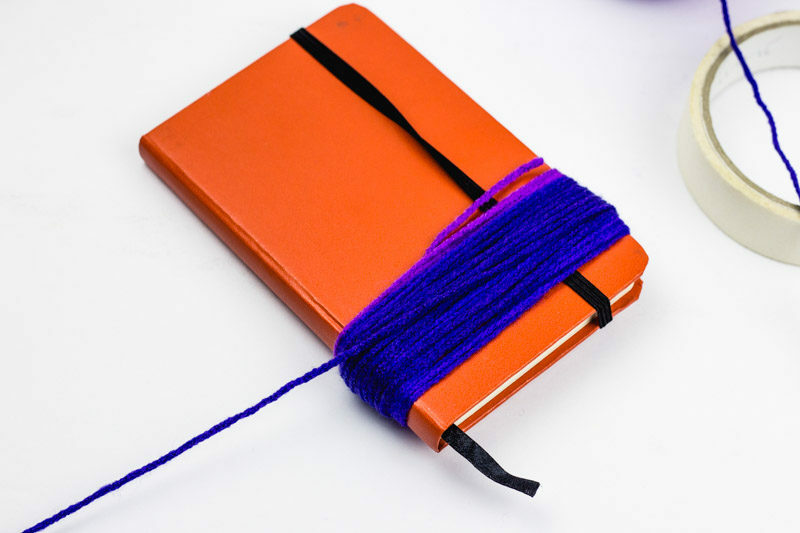 I found a mini notebook that was produced just the right length so I wrapped it and then just cut a bunch at once. 2. 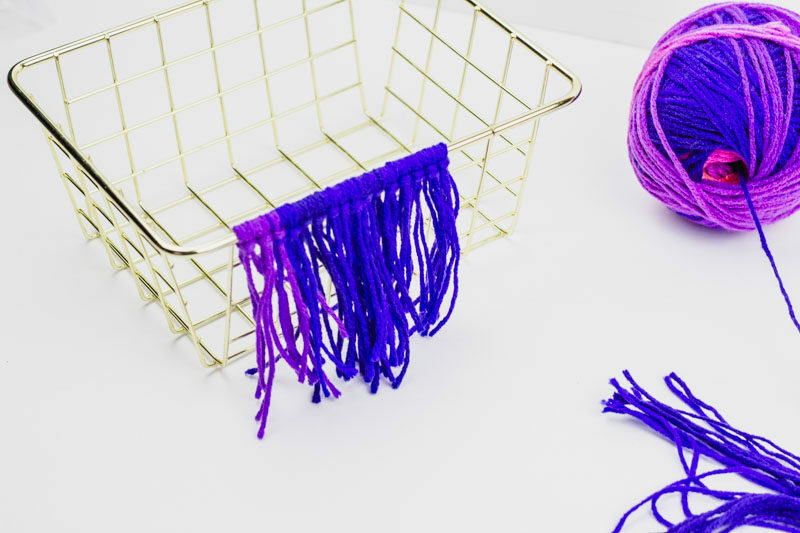 Grab 2 strands of the yarn you just cut and fold them in half. 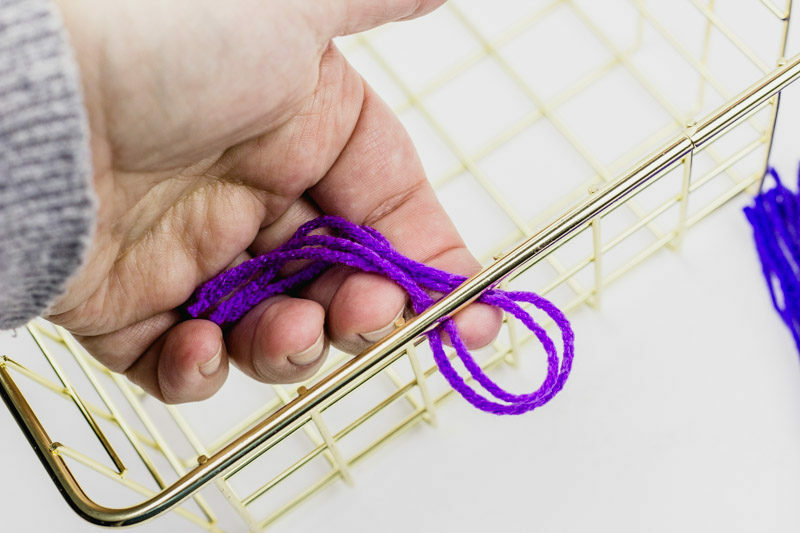 Then Loop them around top edge of your wire basket, passing the free end through the loop to secure it to the edge. 3. 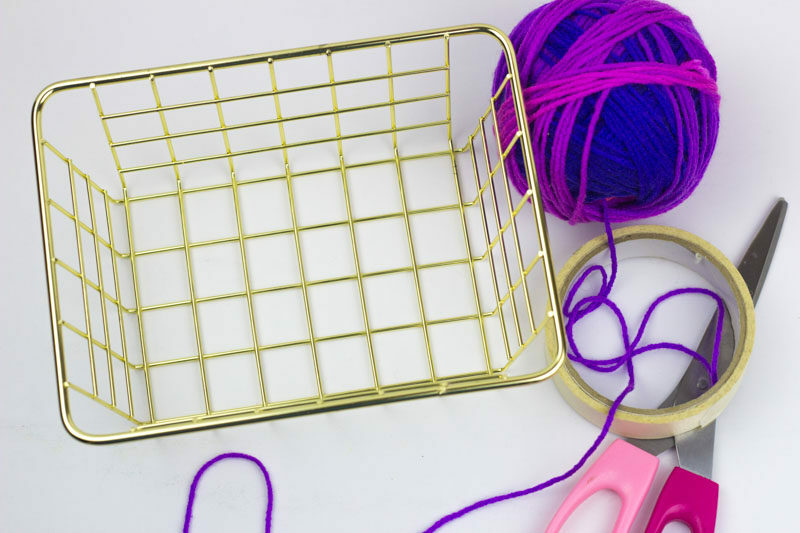 Continue looping and threading yarn until you’ve filled the entire width of the basket snuggly. 4. 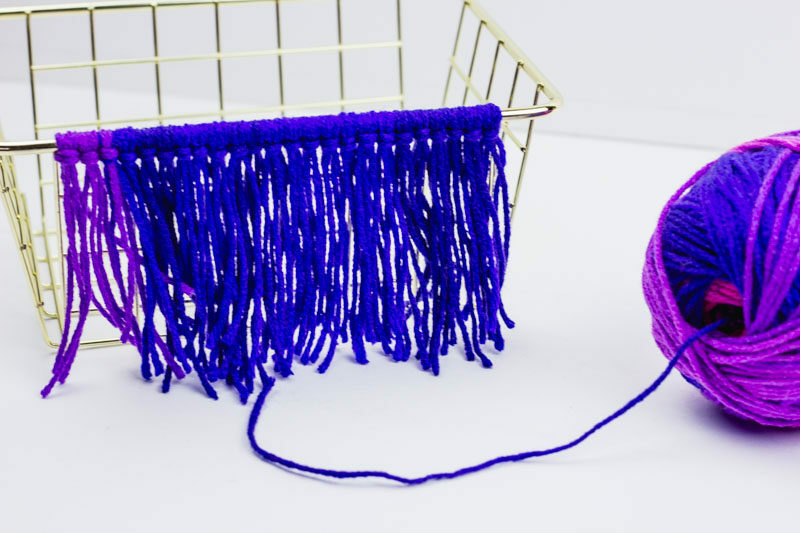 Tip the basket over so that you can lay the yarn flat against the table. 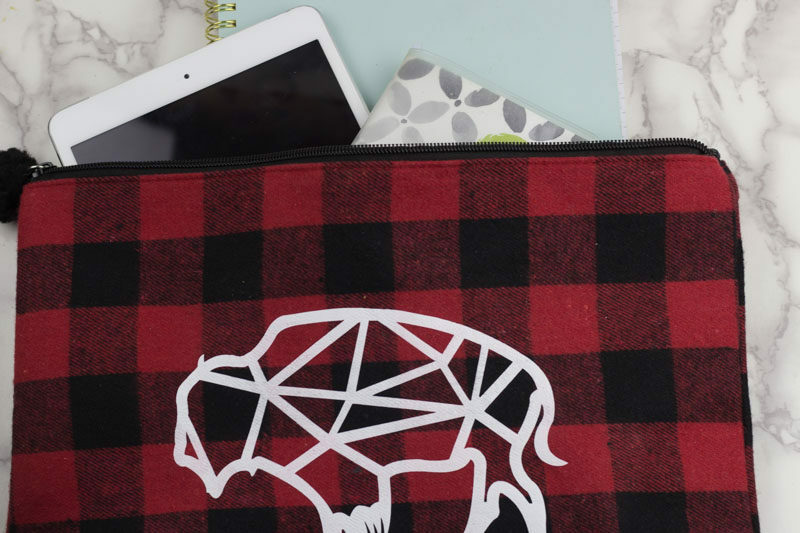 Using the masking tape, tape off the arrow shape you’d like on the front and back. 5. Cut across the masking tape. 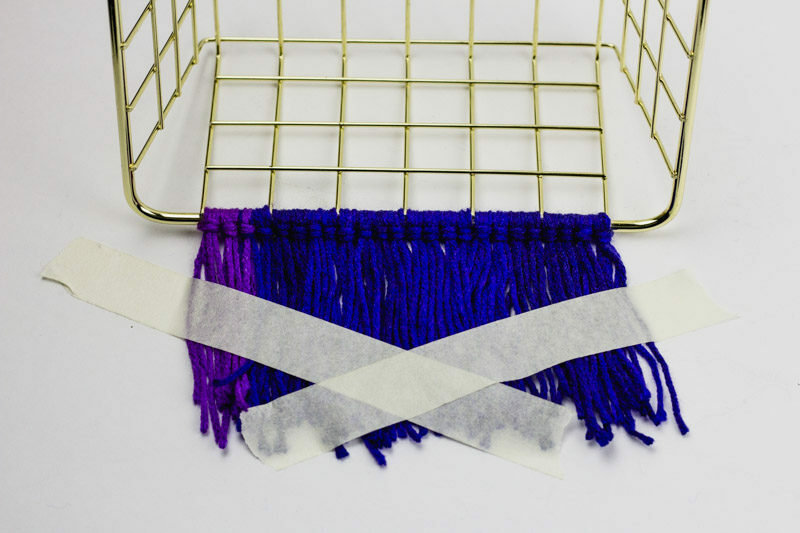 This will assure that your yarn stays in place and gives you a clean line once you’re done cutting. 6. 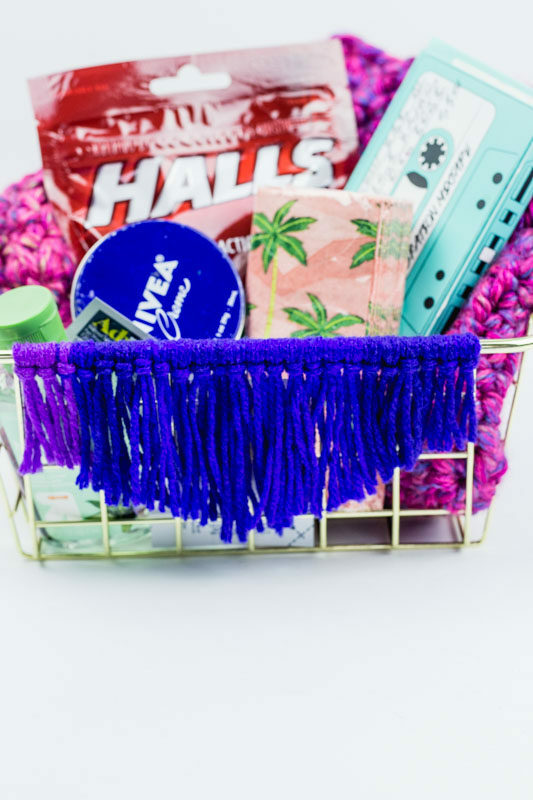 Fill the basket up with all types of goodies for a cute Sick Day Care Package! 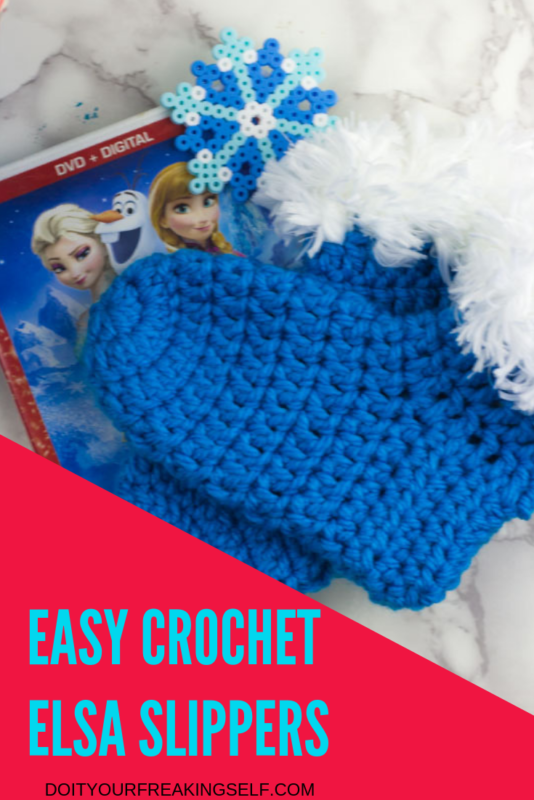 Keep your princess feet cozy this winter with some comfy crochet Elsa inspired Frozen Adventure Slippers! California in the winter is weird. Especially apartment living. Here’s what happens. 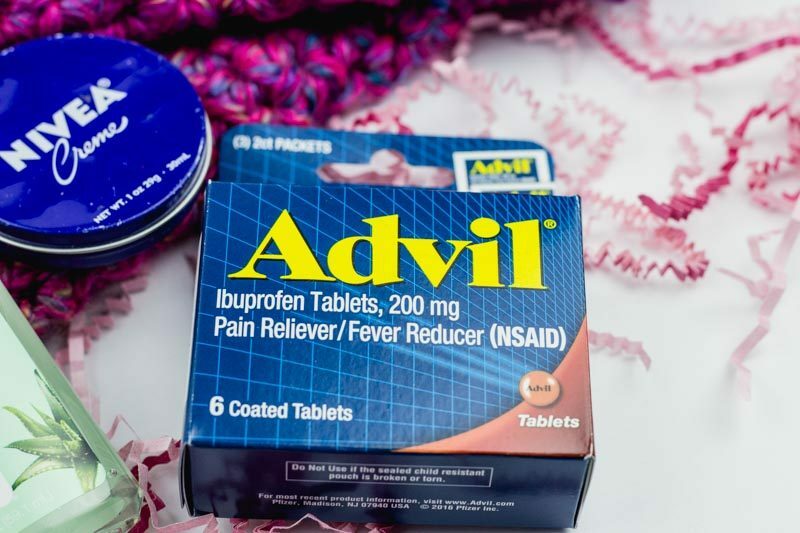 You go to bed at night feeling okay or possibly a little cold. Between 12 and 2 am, you’ve gotta take the covers off because you’re HOT, wake up and its freezing. Then! In the middle of the afternoon, when its 77 degrees outside, you’re still bundled up because you refuse to turn on the heat and it is FREAKING COLD. I used to be able to withstand this… revel in it even. Apparently I am now a California girl who hates weather changes. Who knew! This is also the time of year where I’m still knitting and crochet-ing everything – because it is a post apocalyptic life skill! 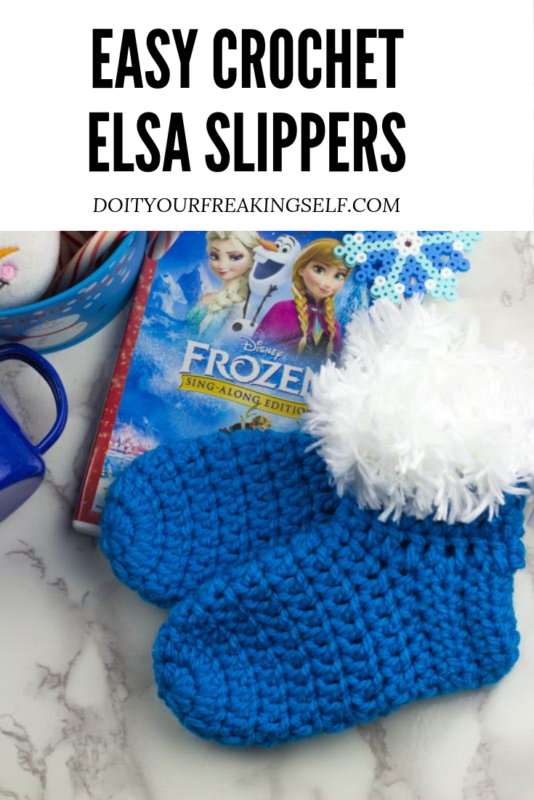 These are some Elsa inspired slippers I made for one of my kiddos who asked santa for “Gloves to go with all of my Elsa Dresses”… so, I figured I’d throw in some slippers to keep her tootsies warm. If you’re looking for an adult version, you can find it HERE. Suggested Viewing: Wreck It Ralph – ya’ll thought I was gonna say Frozen right? Rounds 3-8 Repeat until you have enough length to fit the length of the foot – a little past mid way or before the heel starts. I used 8 rounds for a kids size 9 foot, so you can increase or decrease from there. Tie off end leaving a 6 inch tail. Fold the flat heel portion in half and turn inside out. You’ll have the folded part pointing outwards from the inside of the slipper (if that makes sense). Stitch the edges together to form a heel. Secure the end and weave it in. Then flip the heel right side out! 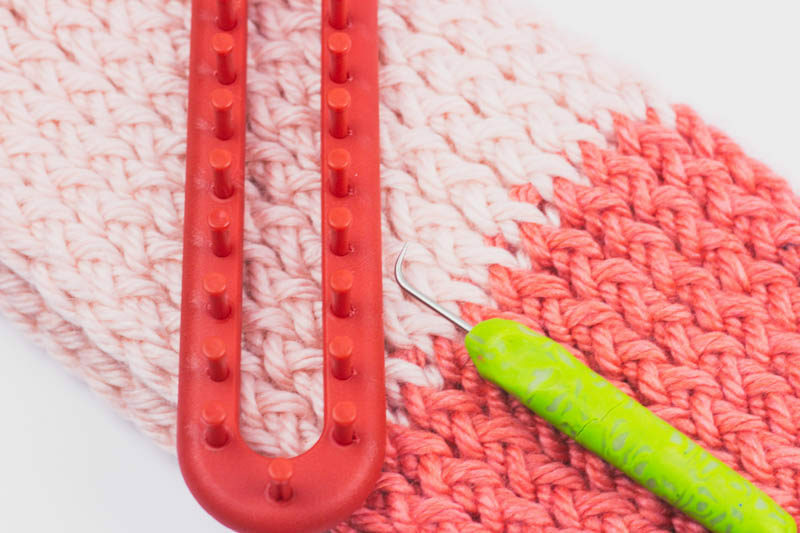 Slip stitch into the top back of the heel you just made. Chain 2. HDC around the cuff of the slipper, you’ll want anywhere from 20 to 24 stitches. 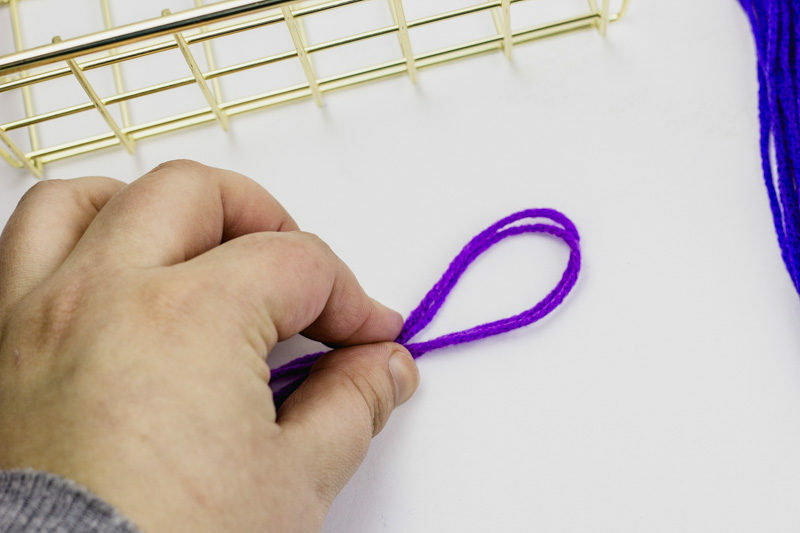 Slip stitch into the first stitch on the round. Chain 2. Build up the cuff by completing rounds of HDC until you’re happy with the height of your cuff. 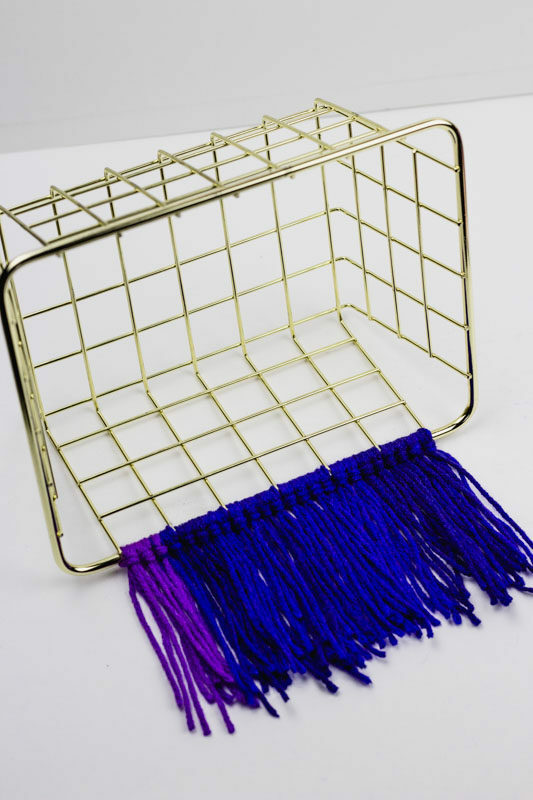 Secure and weave in ends. Switch to Fur Yarn and Single crochet around the top of the cuff for one row. 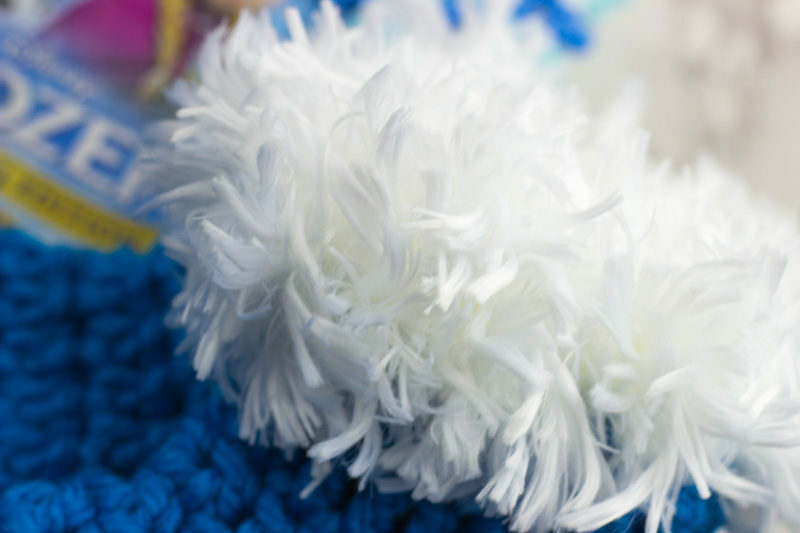 This yarn has so much bulk you’ll end up with a really fluffy edge with minimal work. Fasten off the end. 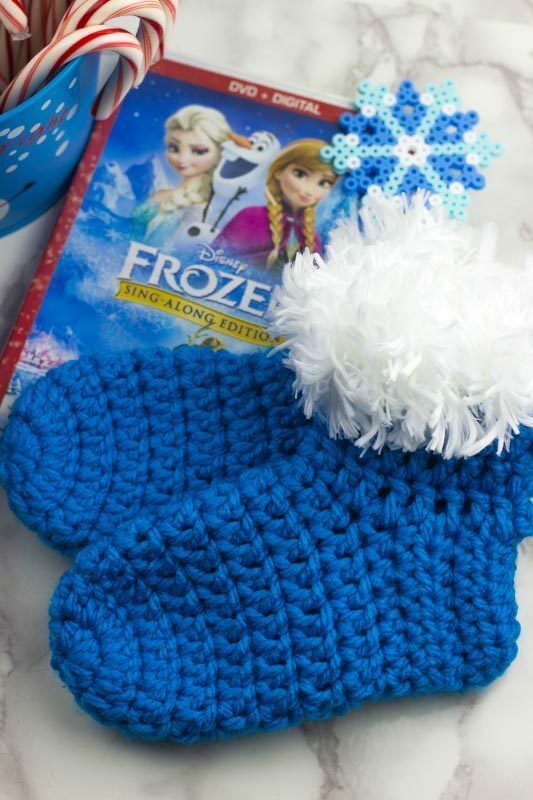 Repeat the entire pattern a second time (because you will probably need 2 of these) and you’re off for your very own Frozen Adventure! 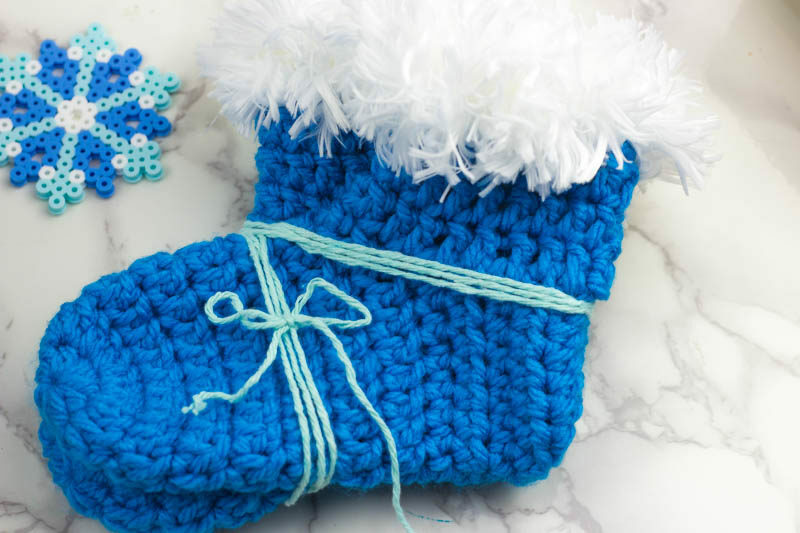 If you want to make these No-Slip, add some puffy paint or hot glue to the bottom. You’ll thank yourself for it later. 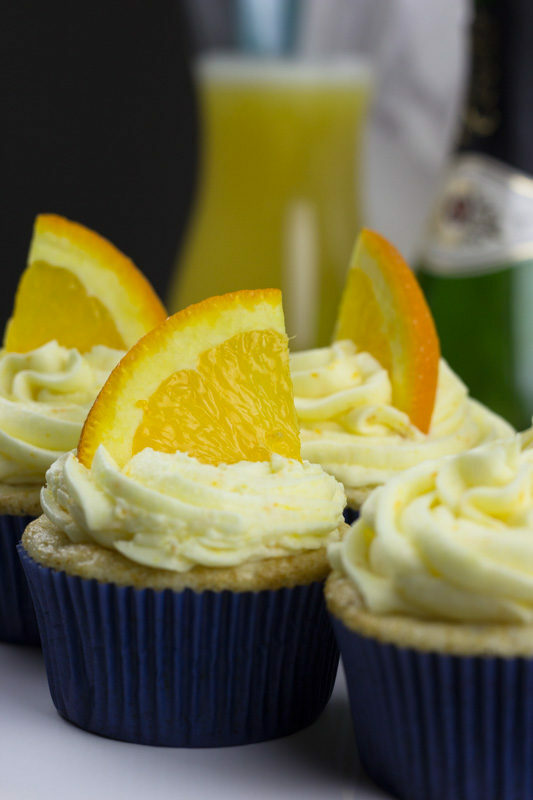 Highlight your brunch with these light these light and fluffy Mimosa Cupcakes! 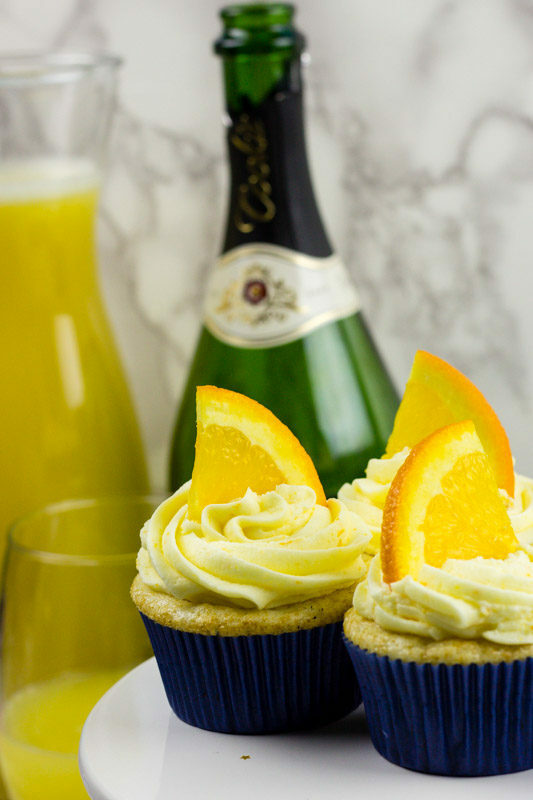 Bring these to a bridal shower and you’ll be the hit of the party! 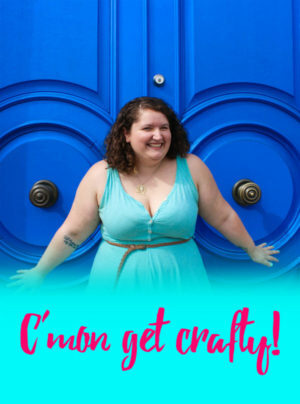 Ya’ll… I can’t tell you how many of my friends posted about being pregnant or adopting or getting engaged or really, any number of big life moments over the holidays. Me? I’m just over here like, same crap different day. I mean, sure, I’m super happy for my friends and all the good stuff they have happening. I just feel like I’m in the middle of the beginning of another story – if that makes sense. I didn’t really do much new year planning this year. I’m maybe in the middle of it, but I did a lot of reflecting. 2018 was hard… and a bit of a dumpster fire if we’re all on the level. But I feel like I actually accomplished something and I need to give myself credit for that. Over the course of the year, I had my ups and downs. Reflecting on it all, it had to happen that way. I learned a lot about myself. In giving myself credit for things, in letting things go. AND YES This is my pat on the back for finishing out the year with a 4.0 GPA. I have 4 classes left until I can apply for nursing school and then we’ll see where everything goes. 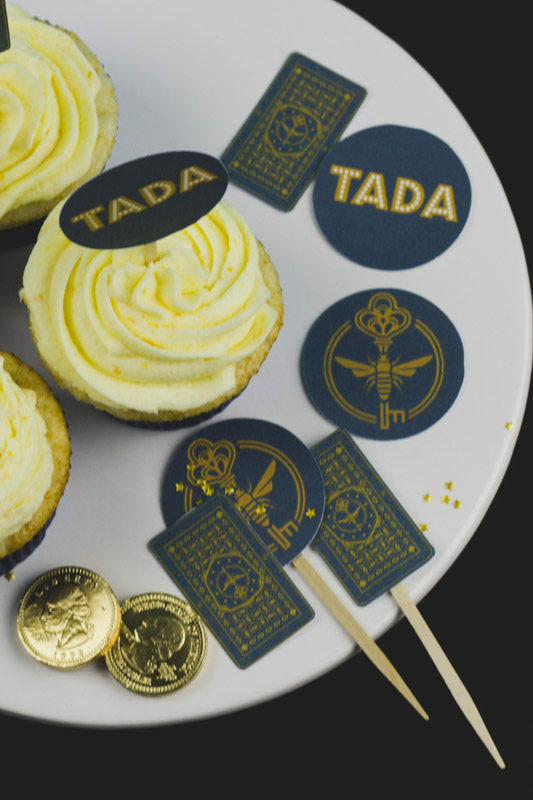 If you came here for cupcakes, this is probably where you should start. 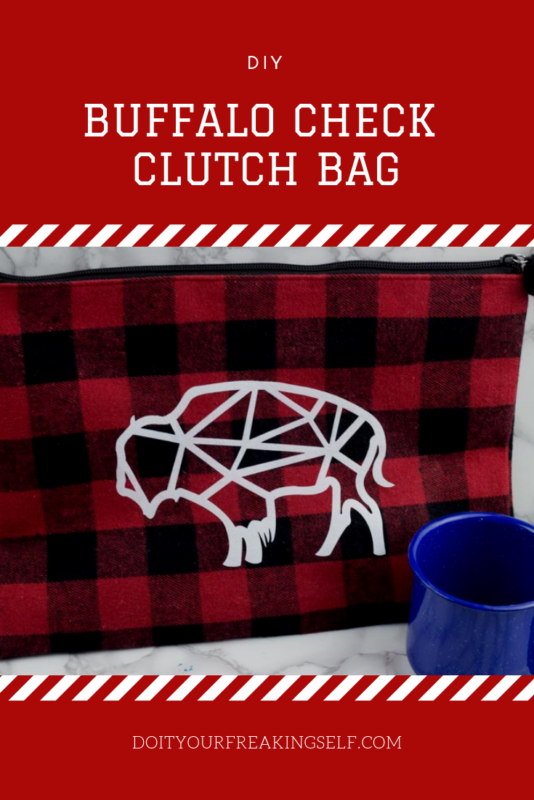 Whether you need a last minute gift or want a new way to rock the plaid, this buffalo check clutch bag is a great project to up your style game! Guess what?!? I finished finals, worked some crazy days back to back and can’t figure out what to do with myself. I guess that is part of not having a regular schedule and also trying to manage all the things – School, work, emotions of tiny humans… also attempting to craft/create occasionally. Up until finals any free time I had was spent studying. Now? 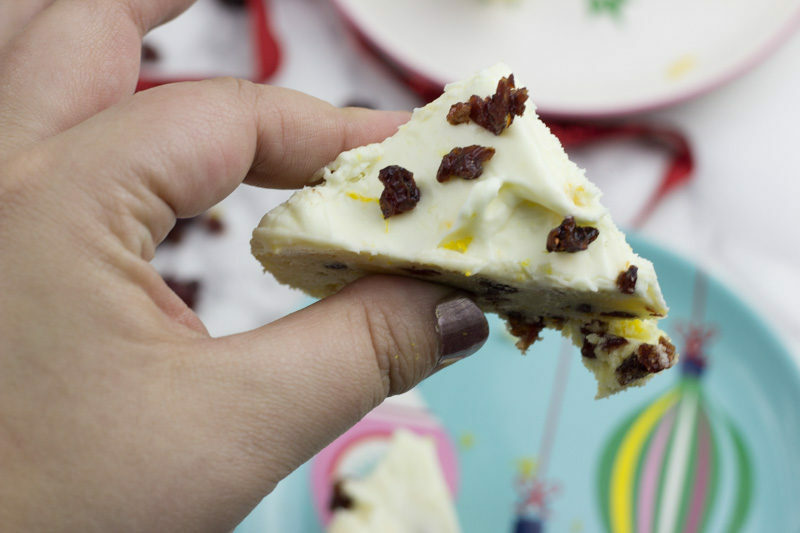 I’m baking and trying to get through all the sewing projects that I have piled up. 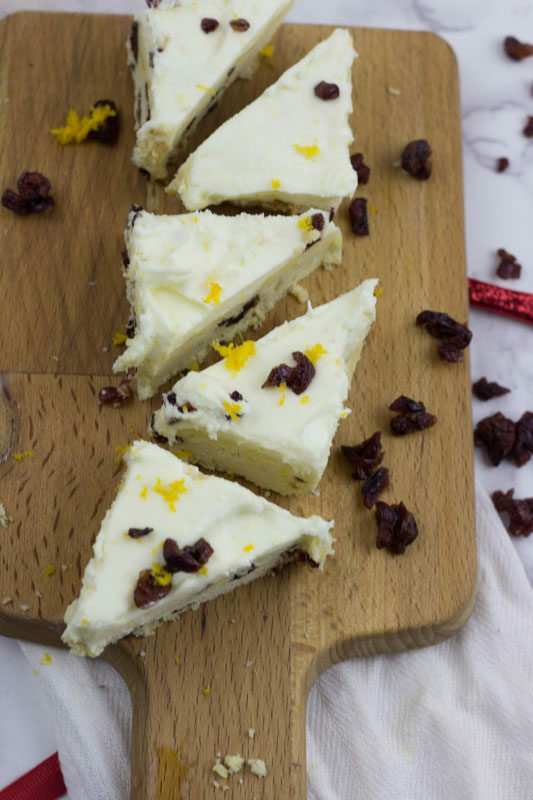 These Orange Cranberry Sugar Cookie bars with orange cream cheese frosting are a delight for all seasons and holiday gatherings. Say hello to my new friend! Pardon the photo quality – I was just so excited and didn’t really take a ton of pictures of it in a professional setting… or any at all. 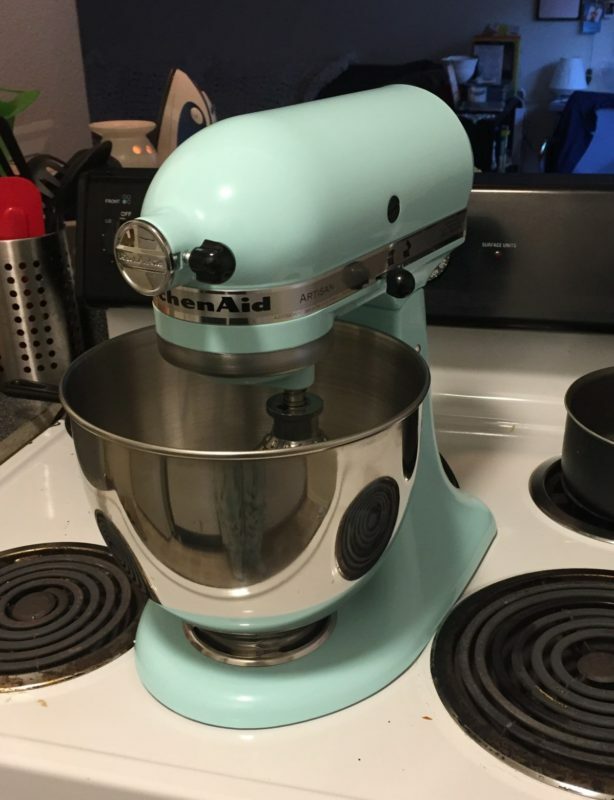 I finally bought myself a Kitchenaid mixer and ya’ll…. LIFE CHANGING. Seriously though. 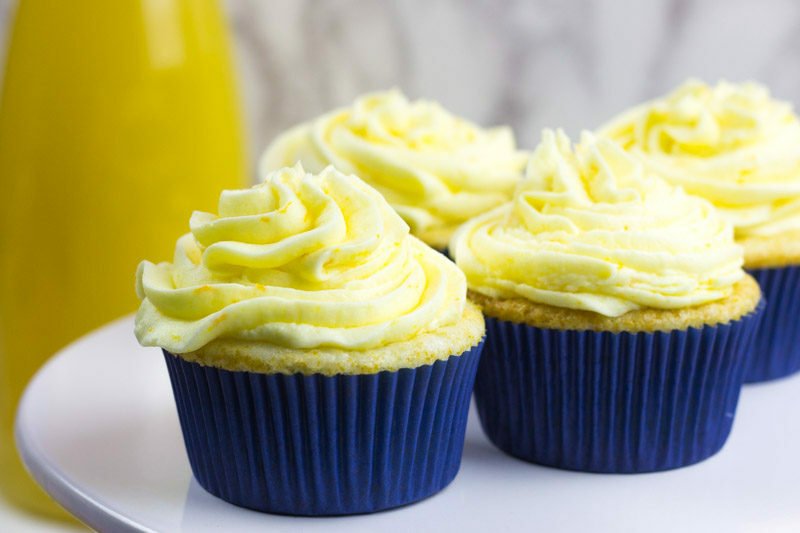 The things I hate doing – like creaming butter and sugar, making cream cheese frosting and whipping egg whites… I don’t have to do anymore! It doesn’t have a name or gender yet, but I figure you guys can give me some suggestions. Okay, so tis’ the season right? I for one am all about the rich chocolates and caramels and of course peppermint is my absolute favorite flavor profile. I am seriously the person that drinks Peppermint mocha year round. Fight me on it. Okay, so why doesn’t this have any of those things in them? I honestly don’t know. I just wanted to experiment with some lighter seasonal flavors. I will say that they turned out delicious and my anatomy class (whom I bring all my baking to these days) RAVED about them. 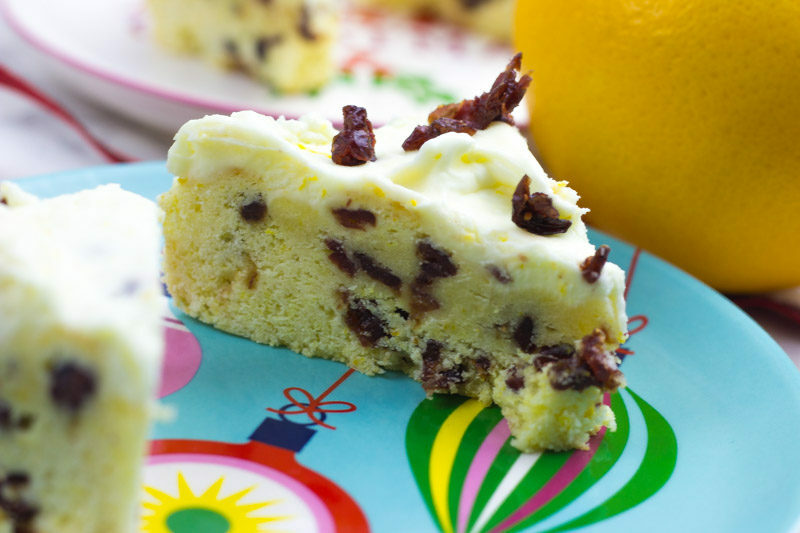 These Orange Cranberry Sugar Cookie Bars are great for bake sales, cookie exchanges and any number of things. I like that they’re easier to cut into at the end instead of trying to measure out or scoop cookies to be the right shape. 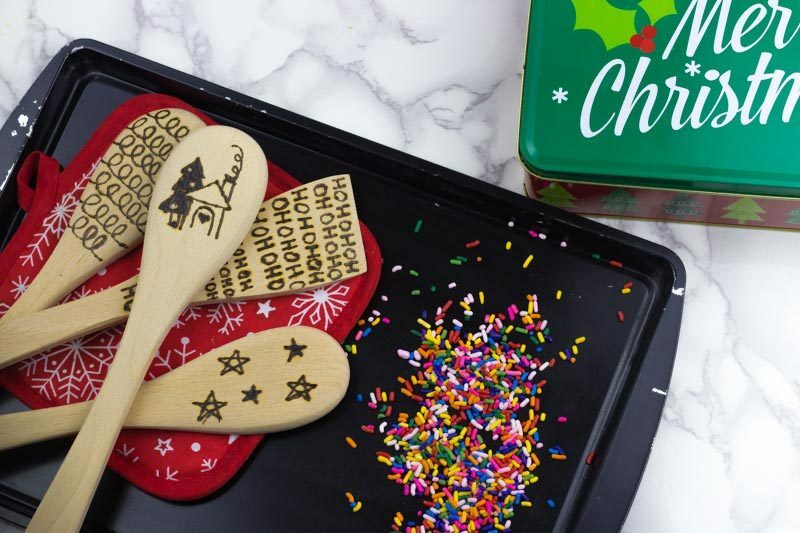 Add a touch of home this holiday season with a DIY Wooden Spoon holiday gift! 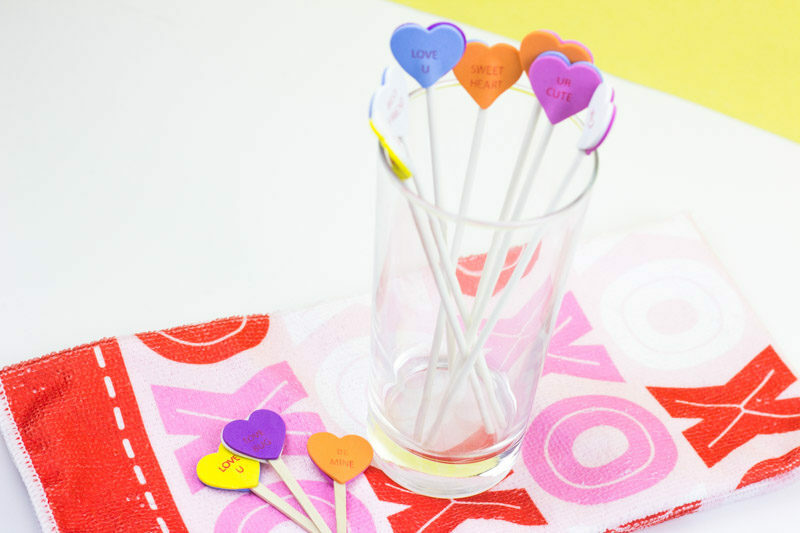 Any easy project to spruce up a kitchen or give to teachers, friends, and coworkers! Hi! I’ve missed you guys! I’m not sure if you’d be interested in all of the goings on of me being in school (of which there are a lot). And I’ll spare you the wonderment that was dissecting a cows eye (I’m pretty sure I was the only one who thought how awesome it was). I do however want to talk about the upcoming holidays. Here’s the thing. I am a STAUNCH believer in no Christmas until after Thanksgiving gets its due. Ya’ll, I have run out of stores yelling (unless I actually had to be in there for something and not just window shop) for playing holiday music before its time. I avoid Michaels and JoAnn’s and Hobby Lobby like the plague. Ask anyone. This year though… I put up my tree early. I was a little disappointed in myself if I’m being completely honest with myself but I’m still sure it was the right thing to do. Here’s the thing, for the first time in 4-ish years, I’m not hosting a Friendsgiving. I’m not baking like a crazy person or cooking for a bunch of people or anything like that. I’m not doing anything. I just don’t have the time or the emotional bandwidth to deal with it all at the moment. 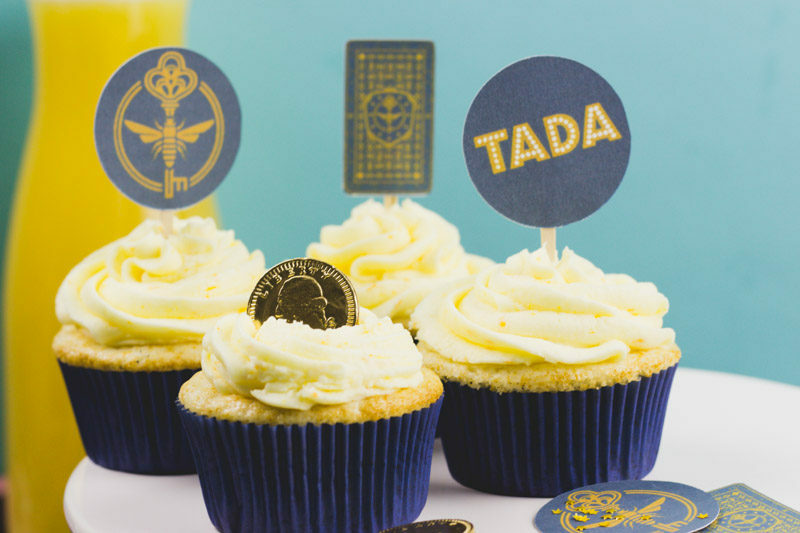 A lot of my friends are in different places in their lives (and locations) and I didn’t want to put it on myself do deal with choosing a date and planning and so on. 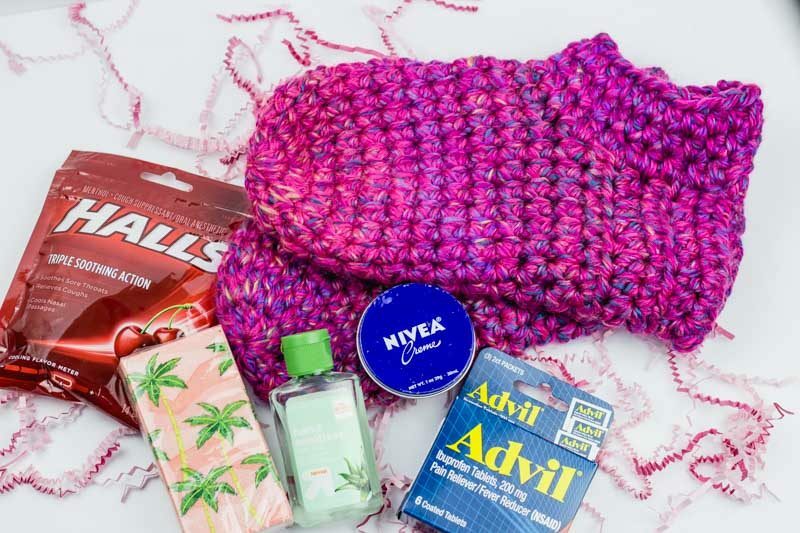 So, I’m moving on to the season of giving, because giving is what I like to do. AND there’s definitely more time to plan right now. I’m not sure how many of you out there deal with seasonal depression, but I’m out here with you. One of the things that helps me is making things for others. I’ve been baking a lot more to give to my anatomy class and attempting to create (read- making lists of things I want to make). I also decided to haul out the woodburner because… why not? 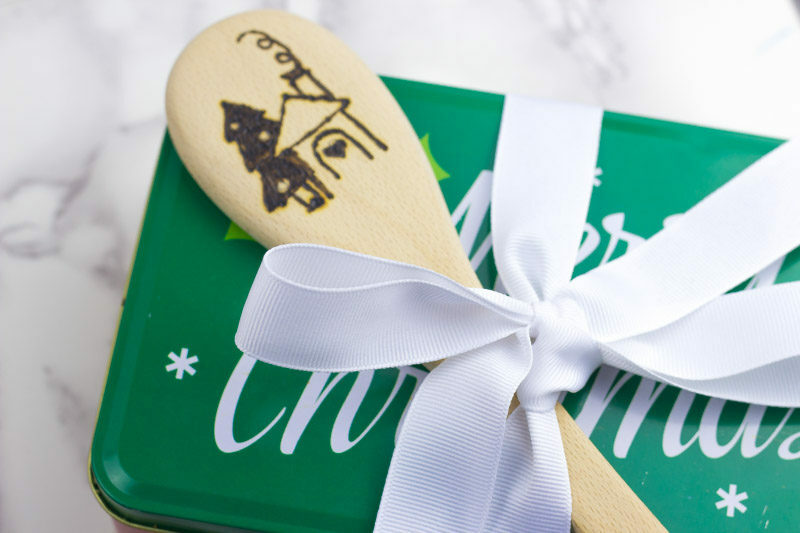 These Custom Holiday spoons are my current fave when it comes to gifting. 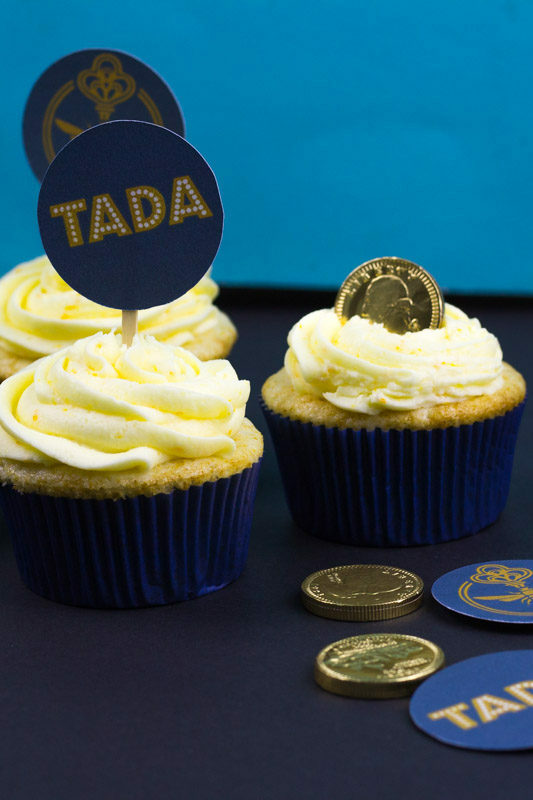 I’m hoping to plan a cookie party here in the near future and think these would be great to give as a gift to all my pals…. so now that these are done… anyone got a cookie recipe they like? Suggested Viewing – Crash Course (Nervous System) – or maybe thats just me?!? Get ready for your first day at Miss Cackles Academy with a The Worst Witch inspired Drop Stitch Scarf! 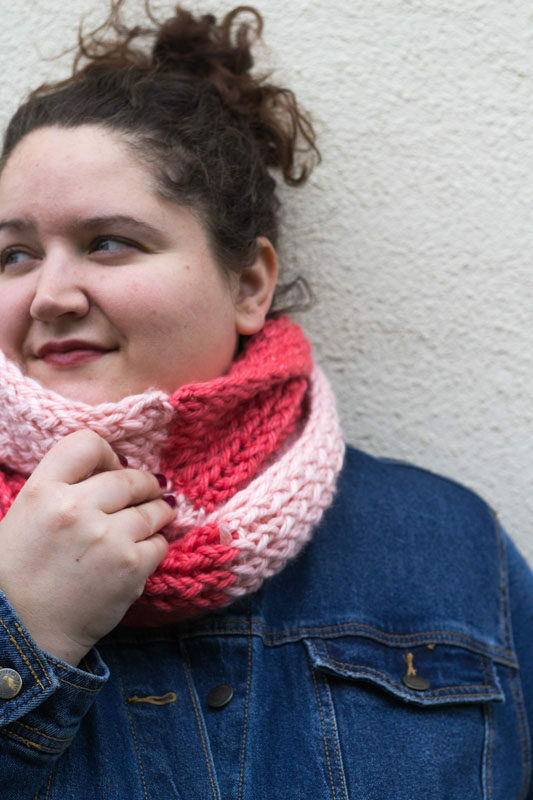 Knit with chunky yarn and big needles, this scarf is an excellent weekend project! …. Climbs out from under a rock….Hi! Hey! I missed you! I know I promised that this blog wouldn’t go anywhere but honestly, I’ve been overwhelmed. The good news is, I can now tell you every single bone in your body, the parts of those bones and the muscles attached to them. I’m both overwhelmed and feeling super educated. Speaking of school… Have you guys watched The Worst Witch on Netflix? I’ve been a bit in love with Mildred – yes, she makes really dumb decisions but her heart is in the right place! I also think I’m pretty much Maude Spellbody – I have a low confidence in my own ability but I’m actually pretty smart (things I’ve learned in school!) and fiercely loyal and defensive of people I love. So yeah, The Worst Witch. One of my favorite scenes in the show though, is when Mildred arrives at the school for the first time in her uniform. Everything is new and she’s maybe a bit uncoordinated. It definitely gives me first day of school vibes! At this point, I fell in love with her scarf – the one her mother made that definitely reminds me of some of my first knitting projects – and the way she defended it from Ethel because her mother worked so hard to make it. I made this scarf a year ago and did all the things but I got super behind and forgot about it. 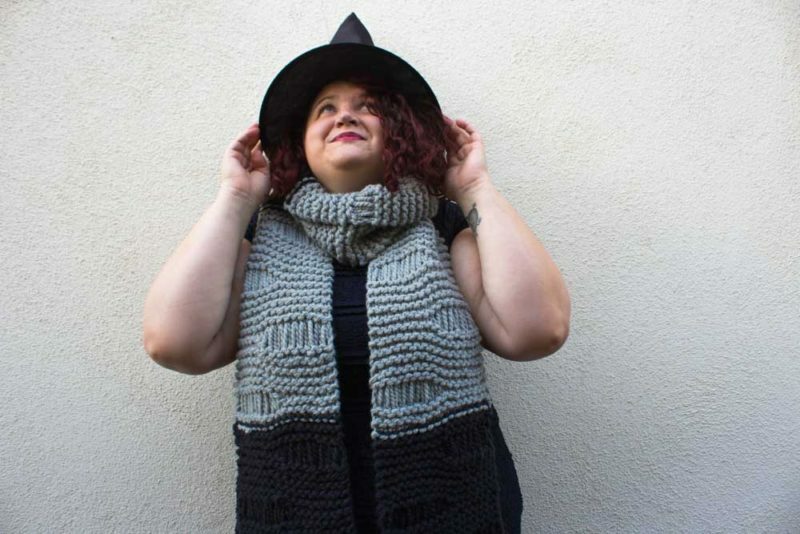 Its knitted in a simple garter stitch (knit) with drop stitches every so often – check out the pattern- and uses a chunky yarn so it knits up super quick!